"This is the absolute best spot for fast food around. Lucky Dog hot dogs are great, fresh pickle, tomato, relish, peppers, Mmmm. " 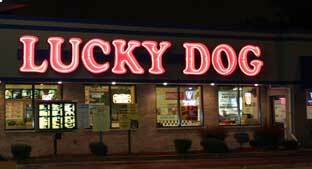 Danyelle D.
Here at Lucky Dog, we take pride in our quality food, served in large portions at reasonable prices. We’re confident that we can offer you the best bang for your buck. For over 33 years, our family business has been adding a homemade touch to fast food favorites. With options including Chicago classics, barbecue specialties, burgers, sandwiches, tacos, salads, and homemade soups and chili- we have something for everyone. Come on by! All four of our locations are open late with drive-thru and carry-out options for your convenience. Call ahead, and we’ll have your order ready for you! Stop in to catch the game, surf the web with our Wi-Fi, or spend time with family. We hope to see you soon!